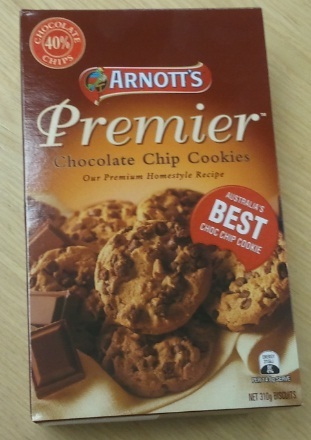 Arnott’s make quite a few different varieties of Chocolate Chip Cookies, and these ones are the ‘Premier’ variety. They come in a smart box, rather than a packet, and inside the box the biscuits are packed in a plastic tray. This means they lack the dusting of crumbs which usually seems to appear on most Chocolate Chip Cookies – something that seems rather strange, like seeing an old friend naked for the first time. Arnott’s do not hold back in their description. These are ‘Australia’s BEST choc chip cookie’, and promise a ‘heavenly eperience’. They contain a full 40% chocolate (compared to the measly 13% in the regular ones); I have seen it suggested that this is the maximum amount of chocolate you can put in without the biscuit dough not being able to hold the cookie together, although I am sceptical of this claim. 40% seems a very round number to be some kind of natural upper limit. Clearly they have fans. There is a facebook page devoted to them, and even Arnott’s employees rate them highly. So am I been churlish by saying I was rather underwhelmed? 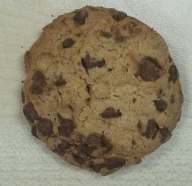 They really didn’t seem much different to any other brand of choc chip cookie, to be honest. Yes, perhaps a bit more chocolate, but not so much that it really stands out; if you served these up without showing the packet I doubt people would particularly comment on the high chocolate content. I think the problem is that the chocolate chunks are too small; they are the same as the chips used in the other varieties (indeed, I’m fairly confident the recipe is exactly the same, just with more chocolate chips poured into the machine). This means you don’t really get a full-one chocolatey experience in they way that you do with cookies that have large chunks of chocolate that need to be chewed into pieces. So all in all, a bit of a disappointment. Tasty, yes, but not quite up to the star billing on the packet. I’m going to give these a seven out of ten. It’s called ‘brand extensibility’. Take the name from a successful product and apply it to something else, and perhaps the halo will rub off (to mix a metaphor). Done well, it makes the brand more powerful and draws in consumers with a wider range of high quality choices. Done badly it turns people away as the brand becomes tarnished by an inferior product. So how have Arnott’s done with their ‘Tim Tam Crush’ range? The idea seems to be to remove the top biscuit from a Tim Tam, pile more filling on top, embed bits of stuff into it, and then coat it in chocolate. Personally, I think this is a bad idea from the start. Tim Tams have, by definition, two biscuits forming a sandwich. Something with an unenclosed filling only on the top is not a sandwich in my book, whatever the Danes might say. Still, I tried to put my prejudices aside to sample the Tim Tam Crush Honeycomb; in which the ‘filling’ (topping?) is mixed with pieces of hokey pokey. They look quite interesting, with the honeycomb bits poking out through the chocolate coating. However, to eat they lack something. They are soft when you bite into them, and there’s just too much sweet sickly stuff. Tim Tams (other than the marvellous dark chocolate varieties) have a tendency to being slightly over-sweet in any case, and this just amplifies that. So what are they lacking? Probably a biscuit on the top, to be honest. Why mess with a winning formula? So the verdict is that this is not a winner in the brand extensibility stakes. 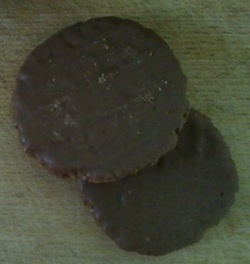 Call ’em something else, Arnott’s, because these rather sickly biscuits are not worthy of being called Tim Tams. I’m going to give these a six out of ten. 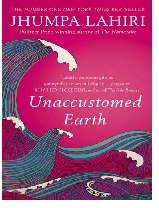 Unaccustomed Earth is made up of eight short stories, each a luminous vignette into how lives and characters are affected by migration from India to the United States. They are beautifully written, and the characters have enormous depth and complexity which makes this very compelling fiction. Jhumpa Lahiri creates a world that immediately draws you in; with just a few deft sentences a rich tapestry of people, places, motivations and relationships is laid out in exquisite detail. Many of the stories deal with similar themes; of second generation immigrants pulled between the conservatism of their parents and the culture of the wider world, of the sense of displacement that comes from leaving everything, and of struggling to find a place in the world. However, these similarities do not detract from the book, but rather add to it; you come away from the book having explored many different facets of these issues in a way that is enriching and satisfying. There is a great article here from by Dave Horton, a sociologist (and committed cyclist) who has been studying the barriers to cycling adoption in the UK. ‘We need to move cycling out from its still marginal status as an urban mode of mobility. We need to make cycling ‘normal’, or ‘mainstream’, or ‘irresistible’. In order to to this we need to build a cycling system to replace the car system which is today dominant. Those of us who currently love cycling must recognise that cycling will change as a result. It’s therefore probably unrealistic to expect us all to embrace the necessary changes enthusiastically. 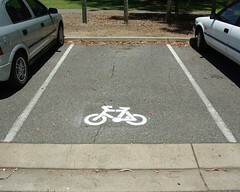 I think this points to some of the problems with much (although not all) of the bicycle advocacy in Australia. The primary goal of many advocates is to get more people cycling like they do it, rather than recognising that there are actually very few people like them (me! ), and that creating a mass cycling culture requires cycling to change. Some time ago I remember reading a blog by an English guy who had moved to Holland; I think he may have been a bicycle messenger. He found Holland a frustrating place to cycle; too many bikes travelling too slowly on busy cycleways. When I ride the Radish to work, loaded up with stuff, I love Clover’s cycleways. They are perfect for that slightly ponderous ride, usually with me dressed in jeans. But when I ride the fixie, I often eschew the cycleways, taking a longer way around Hickson Road in order to enjoy getting the legs flying, keeping up with the traffic and working up a sweat. I guess it’s an interesting question. How would you feel if you had to ride predominantly on cycle-specific infrastructure and were held up by lots of slow cyclists? Is that a price you would be prepared to pay to get 25% of people onto bikes? ‘and looking after our passengers in the economy cabin today is Tina Wafer‘. The WhitePages reveals that there are only 18 Australian households with the family name ‘Wafer’, and none of them are ‘T’. However, there are three bone fide Tina Wafers in the US. I’m very tempted to send all three of them a packet of these biscuits. If you’re out there, Tina, do get in touch! Now, I’m not a big fan of wafers. But I was expecting these to simply be smaller versions of the ‘Triple Wafers‘ previously reviews, perhaps packaged up for small fingers. It seems, however, that they are not. They seem to be lower quality; the cocoa one is less chocolaty, the plain one more sickly and insipid. 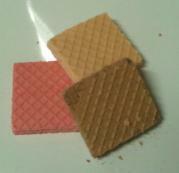 The pink one tastes the same, but then all pink wafers taste the same pink taste, so that’s no surprise. All a bit disappointing, really. I’d say a three out of ten. Just how many biscuits do you need to go with your coffee? We recently looked at the ‘Morning Coffee‘ biscuit, and now the ‘Milk Coffee’. And why is there no ‘Afternoon Tea’ biscuit? These are the things that keep me awake at night. I actually think that this biscuit is the slightly upmarket version of the ‘Morning Coffee’. This one sports the full Arnott’s livery, and is available from the supermarket, as opposed to the ‘Morning Coffee’ which seems to be aimed at institutions. Ahem. Sorry, got a bit carried away there. Still, the idea of putting a chocolate coating on the Butternut Snap is no doubt a good one. It all goes together quite harmoniously with the topping adding chocolatey richness to the biscuit without overpowering the flavour of the original. I’d give these nine out of ten. Definitely a good one to pull out when you have guests.